This blog will be taking server administrators through the VLT dilemma. The blog will not be discussing any networking concepts in detail as I'm not the right one to do so. :) ... But I can help you to understand the Dell MXL VLT concept. 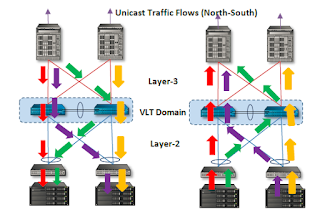 VLT (Virtual Link Trunking) is a logical domain which consists of multiple MXL switches. VLTi is the physical interconnect which connects the peer switches. In VLT, each peer switches will have its own management, data and control planes. All required protocols and configurations should be configured separately in each switch. The peer switches will exchange L2 related tables with each other. Uplinks from the switches can be bundled to an LACP. The ability to create LACP between the switches would eliminate the need of STP thereby increasing the link bandwidth. The only supported STP protocol is RSTP and is only used to avoid looping in case of incorrect cabling. How is it different to stacking ? When we discussed about WWN in my Back To My Basics series, we talked about WWNN and WWPN. Normally for a dual port HBA card in a server, there will be two WWPN and one WWNN. This is pretty fine for a normal standalone server. But what if this server is used as a VMware Hypervisor, and one of the VM inside this hypervisor has a requirement to have a direct FC connection to SAN. In the current scenario, it is somewhat possible via RDMs or Raw Device Mapping. For mapping an RDM, a LUN is directly presented to the WWPNs of all ESXi hosts in the cluster and that LUN can be mapped as a RDM disk to the VM. But still the VM is not close enough to the storage and there exists an intermediate, the ESXi, as VM uses the WWPN of the host HBA of ESXi for connectivity. This gap can be bridged using NPIV. I've been posting blogs on various features and troubleshooting tips over the past few years. But I think it is time to go back to my basics. Something which I feel as the building block of a good system admin. In this 'Back To My Basics' series, I'll be revisiting some of the system basics. You may be an administrator in VMware, Windows, Linux or even network. Do you think that you always get to hear something only from your area of expertise ? definitely not...The basics should be strong enough for you to understand technologies in the course of design or engineering discussions. Nithin Radhakrishnan is a Technical Evangelist working in an MNC in India. He is a VCAP certified engineer and a part of design and implementation projects in the company.